First Nations appreciates the ongoing support and dedication of donors Mark Habeeb and his wife, Wendy Mills. Longtime First Nations supporter Mark Habeeb knows what it takes to change the world: A bottom-up, top-down approach that tackles the big picture and the everyday details. When it comes to uplifting Native communities, he sees the need to both change the overall narrative of Native Americans and create opportunities for every child born on a reservation. This dual approach is what drew this Washington, D.C.-based educator to First Nations and continues to fuel his dedication. 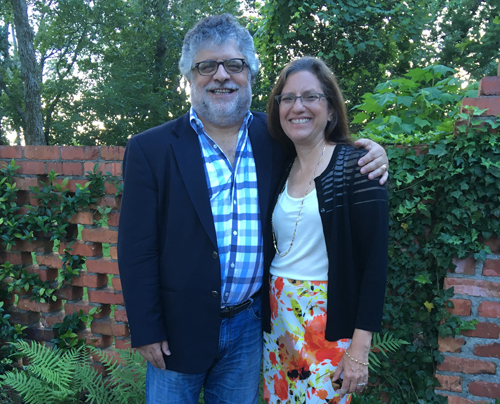 Born and raised in Birmingham, Alabama, Mark went on to graduate from Georgetown University, and then obtained his master’s degree and Ph.D. from Johns Hopkins. He served as an international consultant and foreign policy advisor to a U.S. senator before becoming a professor at Georgetown’s School of Foreign Service, focusing on negotiation and conflict resolution. Mark has written several books on international affairs, world history and culture. This broad educational and professional background has given him an enhanced ear to issues in humanity and the plight of marginalized populations. One of those populations has been Native Americans. Mark notes that prejudice in America dates back to “Day 1,” when Native people were declared illegal in their own land. “You often hear slavery described as America’s original sin. While yes, that was horrific, I would say that the original sin was the genocide of Native Americans,” he asserts. With this in mind, Mark knew he wanted to give something back to Native American communities, and he sought an organization that aligned with his approach to effecting change. Wendy, right, with artist Maria Romero, a potter, during the First Nations Southwest Tour in 2017. For Mark, First Nations’ focus on enriching and sustaining Native cultures and traditions through investments in communities was especially appealing. “Because when you empower individuals and communities, you dramatically increase the potential for impact and sustainability. 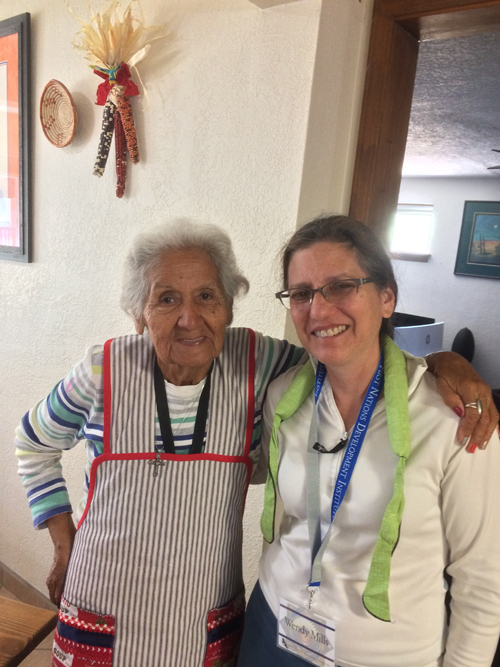 Mark and his wife, Wendy – who shares his admiration for First Nations’ work – were able to see the empowerment in action when they joined First Nations on its Southwest Tour of some of First Nations’ grantees in the Santa Fe, New Mexico, area. First Nations conducts the tours to show first-hand how First Nations supports homegrown solutions to community needs. Here, Mark and Wendy could see the preservation of cultures, language and food, which Mark says sustains communities and makes them interesting. One of the things the study showed was that many people polled didn’t think Indians exist anymore. He said he was disappointed and shocked by that finding, but that it is indicative of what Americans are taught to believe. Mark talks candidly about what he sees regularly in Washington, D.C. – Outrage over racist remarks by an American president, while at the same time city-wide cheers for the Washington NFL team with a racist name. The accepted use of such a derogatory word shows how enduring and pervasive racism is in our lives, he says, noting how the imagery of Native Americans is portrayed in our advertising, food products, cigarettes and mascots. 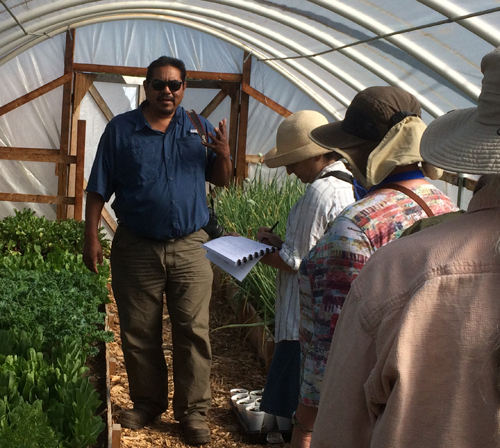 George Toya describes the greenhouse operation at Nambé Pueblo during the Southwest Tour, while Wendy, a Master Gardener (closest to George), listens and takes notes. And this is another reason he and Wendy gravitate to First Nations. How would the world be if everything that Mark, Wendy and First Nations were striving for were complete? Mark says it would be a strong world of sustainable communities. People would maintain a link with their heritage and their past, but everyone would grow up with opportunities to thrive and succeed, however that’s defined. “You could be Native American without that bringing about any prejudice against you,” he envisions. This organization is what I have imagined since my childhood, yet it’s the first I have heard of it although it’s been around for 38 years! Is there a liaison group that is available to make contact with resource groups and vice versa?